Ever wondered what you would look like 30, 40 years down the road? Now, what about if you threw long-term smoking into the equation? My intrepid colleague Jessica (a non-smoker, by the way) agreed to find out, using a nifty digital imaging technology known as “smoke-aging.” Voila! 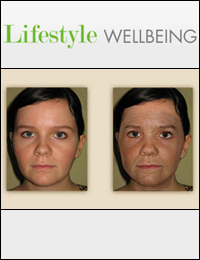 the before-and-after images are to the left. This flash-forward technology supplemented the release of a recent survey from Angus Reid on behalf of Nicoderm and Nicorette, which found that the majority of female smokers are not aware of many immediate and long-term health risks of lighting up. The survey asked which health concerns female smokers associated most with smoking. Not surprisingly, lung cancer came in first among respondents (83%). Next was premature aging of the skin (62%), followed by dental problems such as yellowing of teeth or tooth loss (61%) and heart disease (60%). But, fewer than two in 10 respondents were aware of the link between puffing away and increased risks of developing other health issues including infertility, early onset of menopause, menstrual irregularities, osteoporosis, baldness, premature greying of hair, weight gain, hearing loss and incontinence.